Numerous research studies have validated why print belongs in the marketing mix. Click here to see the research archive. 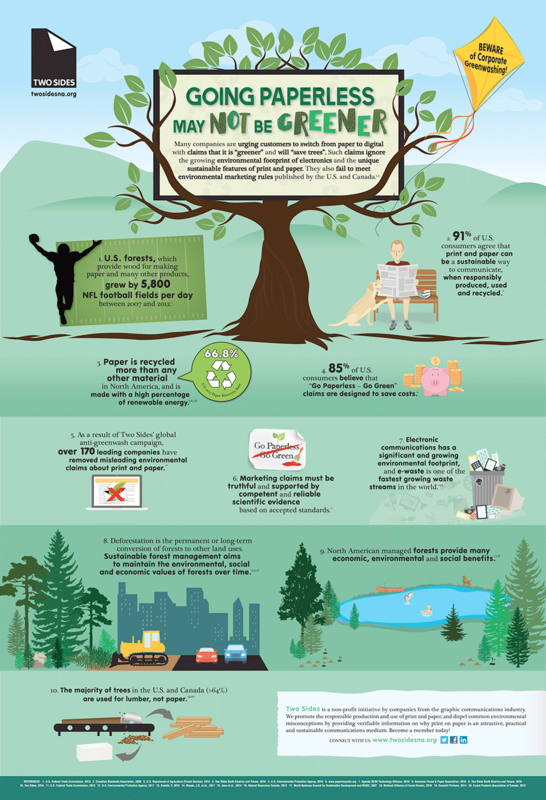 There are many misconceptions about the environmental impact of print on paper. Since printers and their suppliers use natural resources—trees—as a substrate for their products, many people think that by forgoing printing, they are saving trees and making the right choice for the environment. However, the exact opposite is true. Much paper now comes from sustainable forests. These sustainable forests are essentially "tree farms," where trees are grown as a crop, just like broccoli or wheat. When these trees are harvested, new stocks are planted. Print gives landowners a financial incentive to renew forests rather than convert them for other uses, such as agriculture or development. In fact, a number of investigators have suggested that efforts to protect forests primarily through non-market forces could, in fact, results in forest loss. Overall, one-third of the fiber used to make paper comes from wood chips and sawmill scraps; another third comes from recycled paper.In the United States, 76% of paper and paperboard mills use at least some recovered material in their manufacturing process in 2011, while 113 paper mills used recovered fiber exclusively. But that is not the complete story. Print on paper is recycled and reused. In 2016, a record-high 67.2% of paper used in the United States was recycled. This was aided in part by more deliberate curbside and drop-off collection systems. Recycled paper is used to make everything from construction products to consumer goods. Just 11% of the world's forests are used for paper, and in the U.S. the wood used to produce paper increasingly comes from certified forests.The Forest Steward Council (FSC) and Sustainable Forest Initiative (SFI) track fiber content from certified lands through production and manufacturing to the end product. From sustainable forests to the renewable nature of trees and the recyclability of paper, the print and paper industries have a positive environmental story to tell—one in which print on paper and healthy forests thrive hand-in-hand. Source: Two Sides, 2017. Click to enlarge. Two Sides is an independent, nonprofit organization created to promote the responsible production, use and sustainability of print and paper. Two Sides is active globally in North America, Europe, Australia, South Africa, Brazil and Colombia. Its members span the entire print and paper value chain, including forestry, pulp, paper, inks and chemicals, pre-press, press, finishing, publishing, printing, envelopes and postal operators. For more information about Two Sides North America, please contact them at 1-855-896-7433 or info@twosidesna.org. Visit the Two Sides website at www.twosidesna.org and follow Two Sides on Facebook, LinkedIn, and Twitter. Edward L. Glaeser, Professor of Economics, Harvard University, "A Road Map for Environmentalism," Boston Globe. Dovetail Partners, Tree-Free Paper: A Path to Saving Trees and Forests?, revised August 19, 2014. U.S. EPA, Office of Solid Waste, 2014. American Forest and Paper Association, "Fun Facts," 2014.
International Paper, Down to Earth, "Is it Worth Printing?" Copyright ©2010-2016 Printing Industries Association, Inc. of Southern California (PIASC). All Rights Reserved.